Aluminium Roof FAQs | Frequently Asked Questions | Roof lanterns, Glass Roofs, Conservatory Roofs, Orangery Roofs. .
Why choose aluminium over wood or uPVC? Whether you decide to have a Timber, PVCu or aluminium sided conservatory you should insist on an aluminium roof. Aluminium is a perfect material for making roofs. The strength of aluminium allows for slim profile, more glass area and means that large spans are possible. Double glazed glass sealed units are the norm in our roofs. A strong roof means that it can take the load of maintenance boards when carrying out work on or above the conservatory. The roof can be painted in any of over 200 RAL colour finishes. This polyester powder coat finish is very hard wearing, made to last and easy to clean, requiring the minimum amount of maintenance. What are the maximum size roofs you can produce? Our system is suitable for both residential and commercial uses. The style of roof, the rafters used (light duty, heavy duty or reinforced) and the ring-beam type used (structural or standard) all have a bearing on the maximum size limits. Steelwork can also be used for very large roofs. Please send us your design so we can calculate loadings. Why do you recommend glass over polycarbonate? Glass has superior load bearing and acoustic properties. A glass roof will dramatically reduce external noise, from rain, low flying aircraft etc. when compared to a polycarbonate roof, and can take several inches of snow. A glass roof also lets you take advantage of innovations such as solar control and easy cleaning glass. How quickly can you manufacture a roof? We keep a large amount of stock and can provide an exceptionally fast turn around on all of our products, especially white products. For customers that need their jobs urgently we offer a fast track service for an additional cost. Lead times are usually around 2-4 weeks, but please consult our sales department for current lead times, and availability of prices for our express / fast track jobs. Can you supply Double or triple glazing for your roofs? Yes we can supply 24mm or 28mm double glazed sealed units, polycarbonate or we can supply our roofs unglazed so that you can source your own glass. Are your Roof Lanterns suitable for use in conservation areas? Yes. 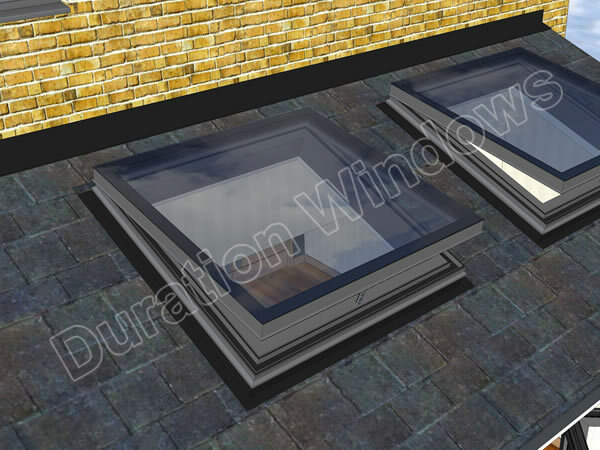 It is common for us to design and manufacture flat roof lanterns for this type of application. These roofs are low lying and installed on a 5° pitch to allow for water run off. Our hipped roof lanterns however are not usually suitable, but can have a pitch as small as 15°. Can I really have ANY colour? Yes, almost. The RAL colour range has hundreds of colours to choose from, covering every spectrum of the rainbow. You can even have a different colour on the outside to the inside of your roof. For example, you may wish to have a grey or brown outside and a decor neutral white colour on the inside. I've not fitted one of your roofs before - what do I need to know / do? We are here to help. If you have questions then please ask and we can post, fax or e-mail details to you. We have fitting instructions available for each of our roofs and we can provide our personal on-site instruction / tuition service, upon request - so you wont just be left with a new roof and no clue what to do - we will be there to help. Do you do supply and fit? We do not provide an installation service, however if you like our products and are looking for a company that can supply and fit them. Then we can provide you with the details of recommended installers from your area from our extensive database of customers. If you are a trade company then you may wish to take advantage of our onsite tuition service. We deliver to anywhere across mainland England and Wales using our own vehicles. Please see our delivery page for further details. 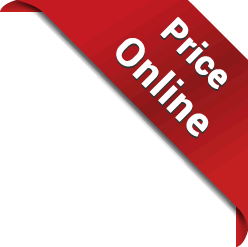 Delivery from Duration for any of our products is free of charge. So you don’t have to worry about hidden costs. We do however require a 1/3 deposit on all orders.